Ever since the US carved up the British Empire in World War II, the Conservative Party has looked Stateside for ideas to plagiarize. It’s thanks to Margaret Thatcher’s close relationship with the administration of Ronald Reagan – the original master of the gaff – that the grounds for the current recession were laid. (No, you won’t find that in the sanitised portrait of Thatcher in The Iron Lady. Just marvel at Meryl’s acting.) The theory of supply-side economics played well on television, if not in fact. Thatcher took what she needed, recast it British style, then proceeded to usher in a new era of corporate greed. Supply-side economics? Look it up, as Madonna would say. (Or track down a copy of Reaganomics: Rhetoric vs Reality by Fred Ackerman, 1982.) The basics: lower taxes and deregulation equals economic growth. And look how well that worked out. Never to be deterred by history – probably because playground politics is practised in a goldfish bowl – the “stuff and nonsense” Tories have been searching for a diversion as they mismanage the economy and dismantle the NHS. So it’s Stateside thinking again. Yes, Conservative political thinking is reductive. So where am I going with this? 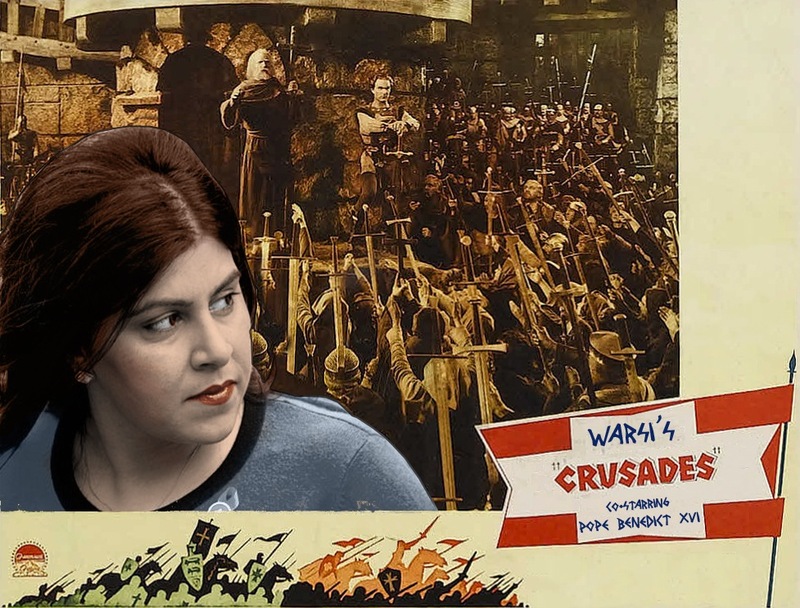 On an official visit to the pope, the Conservative party co-chairman Lady Warsi, the first female Muslim minister, is set to argue that Christianity should be returned to the centre of British life and politics. In a twist of logic, she will claim, “there is suspicion of faith in our continent hinging on a basic misconception – that to create equality and space for minorities we need to erase our religious heritage”. What she means is “Christian heritage”, as she qualifies throughout the speech. (Is that grounds for a fatwa?) There are no focus group stats to back up this tall claim. And so what is the reason? What great events in British society illustrate this fall from grace? “We see it in a number of things: when signs of religion cannot be displayed or worn in tragedy government buildings, and where religion is sidelined and downgraded in the public sphere.” That’s it?!? Really, could you make your argument more vague? In US politics, the Christian religion has been the preferred Diversion Tactic Of Choice for decades. As Richard Nixon put it in the 1960 election campaign, making an issue of Kennedy’s Catholicism whilst claiming he was not making an issue of it, the real threat to America would be a candidate “with no religion at all”. The tactic of the current Christian Right is to cry victim, but what they really want is the right to persecute others using whatever biblical statute will do the job. And so Lady Warsi launches her attack on the secular mind: “For me one of the most worrying aspects about this militant secularisation is that at its core and in its instincts it is deeply intolerant. It demonstrates similar traits to totalitarian regimes – denying people the right to a religious identity because they were frightened of the concept of multiple identities.” This is as untenable as it is crude. She calls for uniformity under the tradition of Christianity in one breath, and accuses phantom militant secularists of rejecting multiculturalism in the next. Like supply-side economics before it, the ideas sound right – we are all against totalitarian thinking, at least in the public sphere – but under inspection they’re nothing more than the hot air of marketing. Let’s make Britain Christian again! Maybe we could bring back the Crusades? Hang on, old chap, didn’t the Bush administration already see to that in its War on Terror? It’s reactionary nonsense. The argument only works if you take it at face value. Our society does not need more religion to tackle its woes. It needs less. The problems in British society are down to economic inequality. Lady Warsi’s delegation is nothing more than a state-funded trip to the Vatican. It’s a diversion tactic in a time when economic division grows wider, and the discontent – the real danger to Conservative politics – becomes more organised.